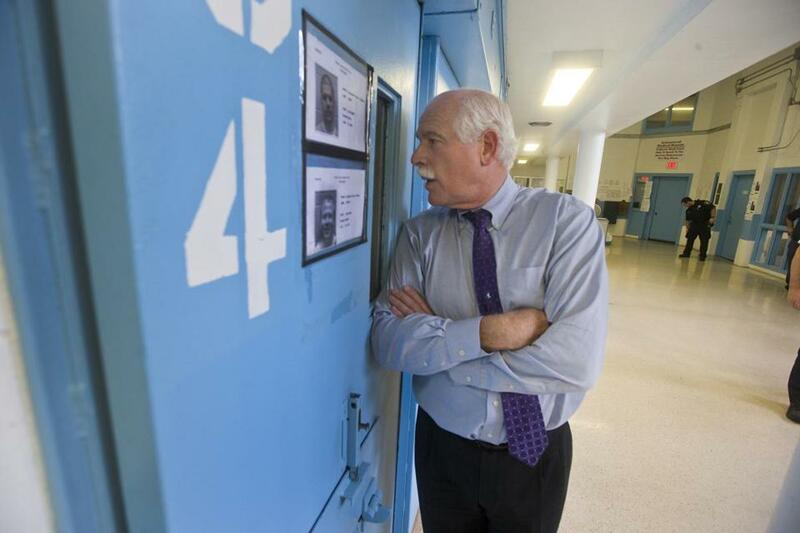 Bristol Sheriff Tom Hodgson chatted with an inmate at the Bristol County House of Corrections in 2014. Thomas Hodgson, the controversial Bristol County sheriff, has been ordered to appear at a civil contempt hearing after he was late to a criminal trial where he was slated to testify Wednesday. Hodgson is blaming the notoriously sluggish rush-hour traffic in Boston for his tardiness. He was traveling from Dartmouth to the Moakley Courthouse in South Boston. There was significant congestion on the Southeast Expressway, then an accident in the South Station tunnel that caused gridlock, he said. “The traffic was bad,” Hodgson said in an interview Wednesday night. Bad enough for him to be two hours late? There’s an explanation, Hodgson said. He said that while his subpoena called for him to appear in federal court at 9 a.m. to testify in the smuggling trial of Antonio Freitas, Freitas’s attorney, Daniel Cronin, told him he didn’t anticipate that Hodgson would need to be there before 10 a.m. When the longtime sheriff arrived shortly before 11 a.m., Judge William G. Young was displeased, Hodgson said. “We apologize and feel bad that the judge was inconvenienced, as were the jurors,” Hodgson said Wednesday night. Freitas, a Bristol County sheriff’s deputy, was convicted Wednesday of smuggling profits of an over-fishing scheme to Portugal, according to the US Attorney’s office. Hodgson said he was asked about whether Carlos Rafael, a New Bedford fishing magnate known as “The Codfather,” had any influence on a promotion for Freitas at the sheriff’s department. Rafael pleaded guilty in March to mislabeling fish, which allowed him to dodge federal rules and increase his profit margin. Hodgson, who was the only defense witness in the Freitas trial, according to State House News Service, denies Rafael held any sway over staffing and promotions at his department. Freitas, a 47-year-old from Taunton, smuggled thousands of dollars to a Portuguese bank account belonging to Rafael, according to the US attorney’s office. He was convicted of one count of bulk cash smuggling and one count of structuring the export of US currency. Hodgson is no stranger to controversy. He has offered to send inmates to the US-Mexico border to help President Trump build a wall. Speaking to a congressional committee in March, he advocated for the arrest of officials who support “sanctuary city” pledges. Hodgson has been ordered to appear before Judge Young for a civil contempt hearing that is scheduled for Sept. 12. He said he will attend that hearing. “Of course I’ll be there,” he said. A message left with Cronin, Freitas’s attorney, was not returned Wednesday night.